Get an opportunity to Visit 9 UNESCO World Heritage Sites. Explore Budapest enjoy innovative, efficient metro. Experience a tour of Bamberg, with its medieval city center, a UNESCO World Heritage Site. Celebrate folk traditions in Romania, Bulgaria, Serbia, Croatia and Hungary. Behold the grandeur of Vienna. See castles on the Rhine. Cruise Amsterdam’s canals. These travel icons—and more—await you on a 23-day journey combining our Passage to Eastern Europe and Grand European Tour cruises. Discover eight countries in Eastern, Central and Western Europe while cruising the Danube, Main and Rhine. Enjoy a lifetime’s worth of experiences on a single voyage of unparalleled enrichment. After breakfast, check out of your hotel and take a morning tour of the city. See the Patriarchal Church, the Palace of Parliament and the Arch of Triumph. You then proceed to Giurgiu to board your ship and enjoy a welcome dinner. Arrive in the picturesque Bulgarian port of Vidin, and take an excursion to see Belogradchik Fortress, built right into the striking Belogradchik Rocks. See the fortress’s amazing construction, begun in Roman times and greatly extended by Bulgarian tsars and the Ottomans, and enjoy breathtaking views. Enjoy lunch aboard your ship; then you have free time to explore Vidin’s city center, Orthodox churches and the ruins of the city’s once-grand synagogue. We depart during dinner. Cruise along the Danube, arriving at Vukovar around noon. Disembark for an afternoon excursion to the charming Croatian city of Osijek. Inhabited since Neolithic times, this area has had several heydays under the Romans, the Ottomans and the Hapsburgs; now Vukovar is revered for its baroque buildings, parks and monuments. Return aboard for dinner. Sail into Hungary this morning, arriving in Kalocsa after lunch. Take a guided city tour including a visit to the Archbishop’s Palace. Then, you are treated to a performance of traditional Puszta horsemanship. Return to the ship and enjoy a festive final onboard dinner as we depart for Budapest. Arrive in Budapest, capital of Hungary. Situated along the Danube, it combines the once separate towns of hilly Buda and cosmopolitan Pest into a city rich with history. Your guided tour shows you both sides, starting with Pest’s National Opera House and historic Heroes’ Square. In Buda, walk along Castle Hill to Fishermen’s Bastion and Matthias Church. Take some free time to explore before returning aboard for a traditional Hungarian dinner. Today is yours to explore Budapest on your own. Visit a museum; do some shopping; ride the innovative, efficient metro; relax in one of the Art Nouveau spas; or see the Great Synagogue and Jewish Quarter. As always, your Program Director can help you plan your free time. Lunch and dinner are served aboard; we remain docked until the wee hours, so spend some more time ashore this evening if you like. Enjoy a day of scenic cruising as you sail along the beautiful Danube toward Vienna, arriving early this evening. After dinner, relax or enjoy an optional classical concert. Today we tour the Austrian capital of Vienna. Ride along the Ringstrasse, which replaced the city walls in the mid-19th century. See some of the city’s baroque architecture, including the world-famous Opera House, St. Stephan’s Cathedral and Hofburg Palace. Return to your ship for lunch. The rest of the day is yours to further explore. As always, your Program Director can help you plan your free time. Or you may take an optional tour to Schönbrunn Palace, the “Versailles of Vienna,” erected in 1778 and graced by a number of formal gardens, Grecian statuary, the world’s oldest zoo and Roman ruins. Today, visit the abbey at Melk, a 900-year-old Benedictine monastery featuring Austria’s finest Italian baroque architecture. See its wonderful frescoes and admire the comprehensive collection of medieval manuscripts in its library. Rejoin your ship and cruise through dinner. Passau organ concert is only available May 1-October 31 and is closed on Sunday. Arrive in Regensburg after breakfast and tour this wonderfully preserved medieval city, a UNESCO World Heritage Site, including structures dating back to Roman times. Discover many 13th- and 14th-century patrician houses and see the splendid St. Peter’s Cathedral. During free time, visit the Alte Würstküche (Old Sausage Kitchen), Germany’s oldest restaurant. Cruise through dinner. During our morning cruise, you may choose to attend a noteworthy presentation about the European Union. Then in the late morning you’ll arrive in Nuremberg; after lunch, disembark for a tour. Visit the ruins of Zeppelin Field, the Nazi parade grounds of the 1930s, and see the Palace of Justice, site of the infamous Nuremberg Trials. See the Old Town area as you walk past the Albrecht Dürer House and Main Market Square. You can spend more time exploring Nuremberg, or join an optional World War II tour including the illuminating Documentation Center. Enjoy free time throughout the evening; dinner is served aboard your ship. We depart in the wee hours of the morning. Enjoy a tour of Bamberg, with its medieval city center, a UNESCO World Heritage Site. Your walking tour includes a visit to the magnificent 11th-century cathedral, reworked in late Romanesque style in the 13th century, and the picturesque city hall built on a tiny island in the middle of a river. Take some free time to enjoy Bamberg and sample some of the town’s distinctive smoke-flavored beer before returning aboard. After breakfast, tour Würzburg’s Bishops’ Residenz, one of Germany’s largest and most ornate baroque palaces and a UNESCO World Heritage Site. Enjoy an onboard lunch or join an optional journey along Germany’s "Romantic Road" to Rothenburg, which features a turreted city wall and impressive Gothic and baroque architecture. Rejoin your ship for dinner and an evening glassblowing demonstration. Wertheim is located at the confluence of the Main and Tauber Rivers. During your morning walking tour, experience life in a typical small German town. Stop in a bakery and a butcher shop, and learn about Wertheim’s glassblowing tradition. Enjoy free time to explore before returning to your ship for lunch. Today, we cruise past hilltop castles along the Rhine; this stunning stretch of the river is a UNESCO World Heritage Site. We pass the Lorelei Rock, which marks the river’s narrowest point; the rock is named after a legendary Rhine Maiden who lured sailors to their demise. This afternoon, we’ll stop to visit Marksburg Castle, the only Rhine fortress never destroyed. Rejoin your ship in Koblenz and dine aboard. Arrive in Cologne during breakfast, then disembark for a tour of Germany’s fourth largest city. Stroll through Old Town past St. Martin’s Church and visit the Dom, Germany’s largest cathedral and a UNESCO World Heritage Site. 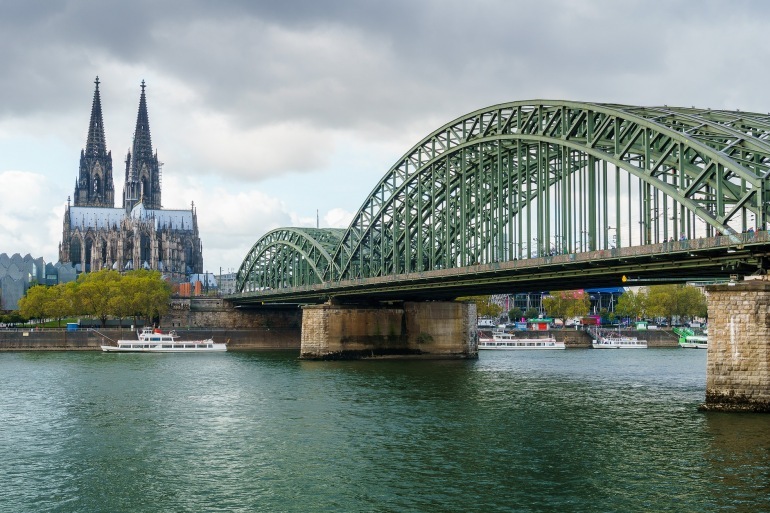 Spend your free time enjoying Cologne’s atmospheric waterfront before returning aboard for dinner and evening departure. We sail along the Rhine during the morning hours, enjoying scenic views. Spend your morning enjoying some popular Dutch diversions: sample Dutch cheeses and jenever, a distilled juniper liquor, and try your hand at sjoelen (Dutch table shuffleboard). After lunch, your ship arrives in Kinderdijk, a UNESCO World Heritage Site, for an afternoon tour of this ingenious network of windmills and other flood management devices. You learn why the windmills were built and see how they work, plus you enter a working windmill for a tour of its mechanisms and living quarters. Board your ship for departure and dinner. Arrive in Amsterdam after midnight.